Will Critchlow of Distilled.net and Larry Kim of Wordstream recently collaborated on a podcast called 10 SEO Experiments That Will Blow Your Mind. It’s an hour of information that’s well worth watching if you’re tasked with SEO or management of Google AdWords accounts. I pulled out my takeaways from the video and started sending some of those to my clients via email, but soon realized it would be easier to refer them to this post. What their experiments proved, and my SEO takeaways. I learned an extraordinary amount from their generous presentation! In a title tag, “Ford cars & Ford vehicles” does not equal “Ford cars”. If a page is ranking well, it’s very hard to write better Title Tags than it already has. Takeaway: Google is not that good yet at recognizing that synonyms mean the same thing. Leave well enough alone. Takeaway: On the other hand, some title tag changes can work overnight to improve rankings. I can confirm this from personal experience. Adding structured data results in a fast and strong uplift. Takeaway: Add structured data (microformats) — it will help rankings. Removing “SEO Text” – (extra text added at bottom of pages, list of cities, etc., solely for SEO purposes) Sometimes it does help rankings when one removes the SEO text, where low-quality text removed equals better rankings. But they did the same thing on a different site and had it drop. Takeaway: Removing crappy “SEO text” is a crap-shoot – you’d think it would help, but it often hurts. Does the click-through rate impact your rankings? Takeaway: Just beat the average clickthrough rate by 3% in any spot in the rankings, and your page will get a boost in its ranking. 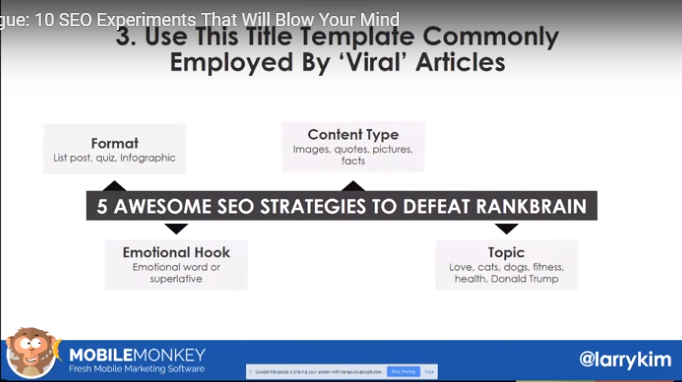 Rearrange the words in the title and see what happens to your click-through rate (CTR). CTR improvement is very valuable. Takeaway: How to change clickthrough rate without changing position? Tweak the order of the words. Does dwell-time (aka “time on page”) impact rankings? Google does measure time on page. Are they using that info to jigger the search results? Takeaway: If you have a high bounce rate, your page won’t stay in the top results. If you have a low bounce rate, it will rise. Improve your content to improve your rankings! What prompts Google to pick your content for its “featured snippet”? A third of the time, the snippet comes NOT from the first page. How does Google choose? Having snippable content and a good click-through rate is important to their selection. Takeaway: An unusually long “time on page” will sometimes make the “featured snippet” come from that page, regardless of its ranking. Is there any relationship between social signals and ranking? Google doesn’t count the shares, but the search listings that have lots of links, also get lots of shares when on Facebook. Takeaway: There is correlation but no causation between Number of Facebook shares of a page and how a page ranks. Is there any relationship between clickthrough rates and conversion rates? Takeaway: The higher the clickthrough rate, the higher the conversion rate will be. The “excitement” carries through. How does “time on page” impact SEO rankings? Google does eliminate pages with low time-on-site. Takeaway: Increase your clickthrough rate. Increase your time on page. Don’t mess with things that are already ranking well – trying to get higher will likely have negative impact. 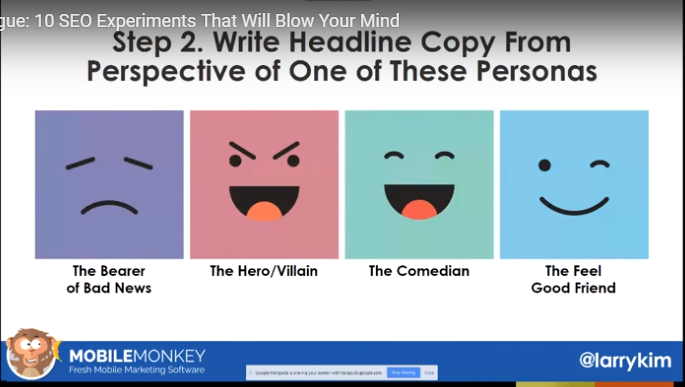 Takeaway: Write headline copy from one of 4 specific person types: Bearer of Bad News | The Hero/Villain | The Comedian | The Feel Good Friend. Takeaway: Test a LOT of things. You need to test 10 Different headlines for the same ad. Takeaway: Familiarity increases CTR. Connect to prospects earlier in the pipeline. Write about stuff and get it out there to prospects BEFORE you try to stuff them into your pipeline.